People trying to find their real parents is a theme that has been done a fair bit in cinema for a long time now. The latest voice to tell the story is that of Jason Wingard’s, who attempts to put a fresh spin to the tale and, for the most part, succeeds. Omar and Pete are two brothers who’ve been raised lovingly by their grandmother after the death of their mother and Pete’s father in a freak accident. After the death of their Gran, they are taken in by the family of Pete’s aunty, who clearly doesn’t like Omar very much. Upon finding a letter from Gran which talks about his biological father, Omar decides to find him. The urn with Gran’s ashes tucked safely under arm, Omar and Pete set from Bradford to Blackpool with an aim to scatter the ashes at sea and find Omar’s father, armed with his birth certificate and an old photo of their mother with the man who is allegedly his father. “Eaten by Lions” is based on director Jason Wingard’s 2014 short film “Going to Mecca”. The 19-minute story from the short has been fattened to an hour and thirty-one minutes, but it doesn’t feel needlessly extended. In fact, it is to the credit of the screenplay by Jason Wingard and David Isaac that it leaves you wanting more. A fair few scenes have been brought over verbatim from the short, but several new characters are introduced to the story that are welcome additions. Humor is a strong point of the film, as evident by the casting of well-known comedic actors, and it often strikes the right chord. Themes of loneliness and a need to belong are nicely touched upon. There are, however, some scenes that do not sit well with the overall mood of the film. A scene that attempts to cause distress in the brothers’ relationship feels underdeveloped and sticks out like a sore thumb. The attempt to set up a romantic angle for Omar also feels feeble and unnecessary. Omar and Pete really carry the story forward and the film required the right actors to play the part. Fortunately, both Antonio Aakeel as Omar and comedian Jack Carroll (of “Britain’s Got Talent” fame) as Pete are competent, if a little inexperienced. While Jack Carroll has played the character before in “Going to Mecca”, Antonio Aakeel is a more suitable replacement for Aqib Khan, who played Omar in the short. They are supported by a very colourful bunch of supporting characters played brilliantly by veteran actors. 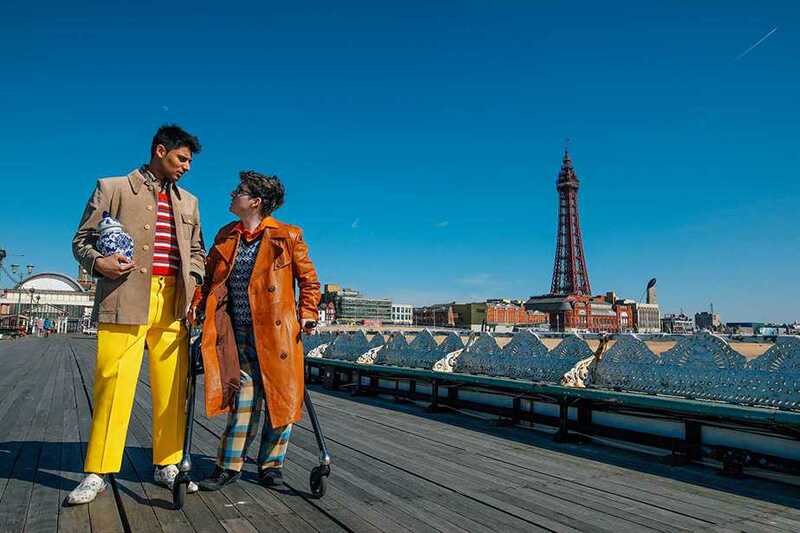 Nitin Ganatra as Malik Chaudhry, who’s allegedly Omar’s father, Asim Chaudhry as Irfan, Malik’s younger brother, Tom Binns as a Fortune-teller on Blackpool Pier and Johnny Vegas as Ray, a hotel owner who takes the boys in when they arrive in Blackpool are a delight to watch. Asim Chaudhry, in particular, gets the most to do with his character and is impressive. While Darshan Jariwala tries to make the most with what he’s got, the actor feels a little wasted. Matt North’s cinematography does justice to the bright, sunny beaches of Blackpool and its nightlife. Certain wide shots are breath-taking, even for someone who’d be fairly acquainted with Blackpool and its surroundings. One particular scene inside Sea World, set against the backdrop of a huge shark tank with the characters in silhouette in the foreground is wonderful. Music is sparsely used but composer Dan Baboulene manages to set the right mood with it. While it would have been nice to see the arcs of some of the other characters in the Malik family explored a bit more, “Eaten by Lions” works fairly well providing several funny situations and genuine laugh-out-loud moments.